Quick and easy to make, these finger licking sticky chicken wings are an ideal appetizer snack for any occasion. 1. Rub the garlic and singer all over the chicken wings. 2. Sprinkle some salt and pepper powder. 4. Mix all the marinade ingredients in a bowl. 5. Pour this over the chicken wings and mix until fully coated. 6. After 5 minutes, transfer this to a greased roasting tray. 7. Place the tray into a preheated oven at 200C and cook for 15 minutes or until the chicken wings are golden and coooked through. 8. Garnish with coriander leaves, spring onions and white sesame seeds. 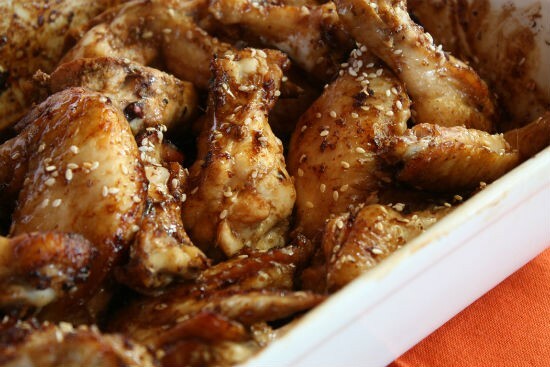 Feel free to comment or share your thoughts on this Sticky Chicken Wings Recipe from Awesome Cuisine.